Mostly grassy fairways with large trees. Wide variety of accurate shots needed. Lake hazards and tunnel shots. Scenic, fun and challenging. 2016 redesign - renamed in memory of Tom "Old Man" McCutcheon. From Tollway, take SR121 west to a right on Main St., to a right on Mill Rd., to a right on Lake Park Rd., to a left on Turtle Trail, to a left on Sandy Beach Trail. 1st tee on right. After being closed nearly a year, DFW's beloved Lake Lewisville Park's Disc Golf Course has re-opened with 3 new, very challenging, shaded in deep woods, 'tunnel' fairways. All 3 ( #9, #10 & #11) have varying 'anhyzer baskets', so bring your forehand or anhyzer drives and be ready to shout "TREE"! The first seven fairways are close to their original designs before the city built a federally funded Hike and Bike trail directly through our 18yr old course. Fairway #1 has a shorter tee pad matching it's shortened fairway. Yet, our iconic #1 basket remains back lit by the sunrise, down on Sandy Beach. Those trees blocking Fairway #3's the 'Over the lake' Anny angle' have been cut and cleared, so get ready, because #3's basket is now up on the hill, alongside #4's Fairway. With a new tee pad, Fairway #7 is now everyone's favorite "Even Longer' Over the Lake Hyzer". Our new Fairway #12 is a long "Hot" narrow drive with Sandy Beach road OB on the left and tall thick forest on the right. The Lewisville City widened Sandy Beach Road and added pull-in parking. Many folks picnic and fish at the Lewisville Lake and the new Hike and Bike trail may bring more wanderers to the park. Remember, the 'Lake' Park Rangers will ticket you for alcohol, so act accordingly. Steven Storrie & Brad Crow of Carrollton's Dynamic Discs did a fine job re-designing a new more challenging 'Lake Park'. 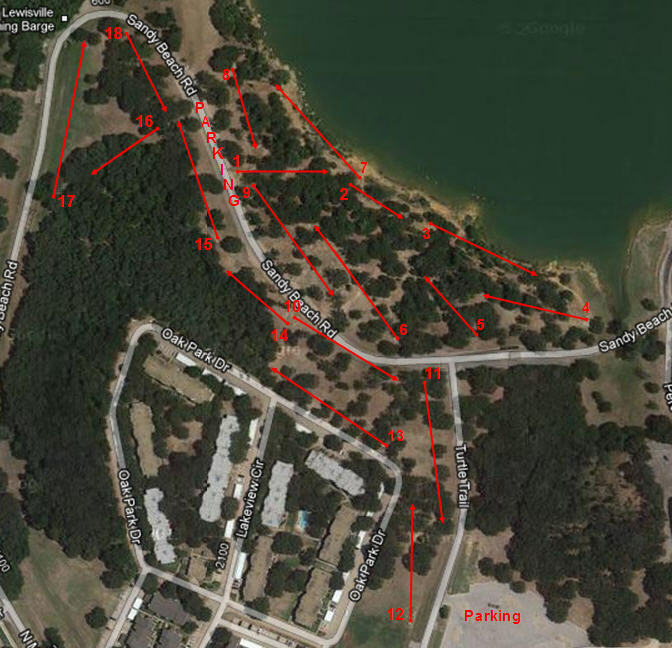 You'll find a new fairway map posted inside the community billboard near #1's tee pad, or you can find it @ Lake Lewisville Disc Golf Park on FaceBook. Lake Lewisville Park has returned as DFW's most loved, and now even more challenging, disc golf course. PLAYED THIS COURSE YESTERDAY AND WE HAD ALLOT OF FUN!IT'S WELL KEPT AND A REALLY NICE PLACE TO BRING THE FAMILY...PLAYS KINDA TIGHT BUT IT HAS SOME TOUGH HOLES! I live in Denton, and it is nice to come out to this course because it's only 15 minutes away. It's also a nice change from the course off Bonnie Brae. Hole 1 is awesome, and if you go at the right time you can catch the sunset by the lake. This course is very challenging, very fun and very popular, which makes for overcrowding to say the least. As mentioned before, you have a lot of shot selections, opportunities for aces and the infamous lake shots, which you will lose a disc to if you play the course frequently. You can get in a quick mini-tourney any saturday it seems. One of the most popular courses in the Metroplex for various reasons. The course has a good mix of holes with some elavation, some ace runs, and various other challenges such as throwing out over the lake or threading the needle through 10 yard gaps. The course is very playable even after rain due to the combination of soil and sand on most of the course. Local amenities include a lighted par 3 golf course, soccer fields, outdoor batting cages, direct access to the Lake Lewisville, and even alcohol is allowed in non-glass containers at the disc course (at least from what I've witnessed). OVERALL-very enjoyable course for all skill levels. Since the course stays pretty busy make sure to bring your beer, fold out chair and patience.